Doodlecraft: Halloween Spider Kisses Wreath DIY with FloraCraft! Halloween Spider Kisses Wreath DIY with FloraCraft! I love Halloween and the combination of black and white with purple is awesome! 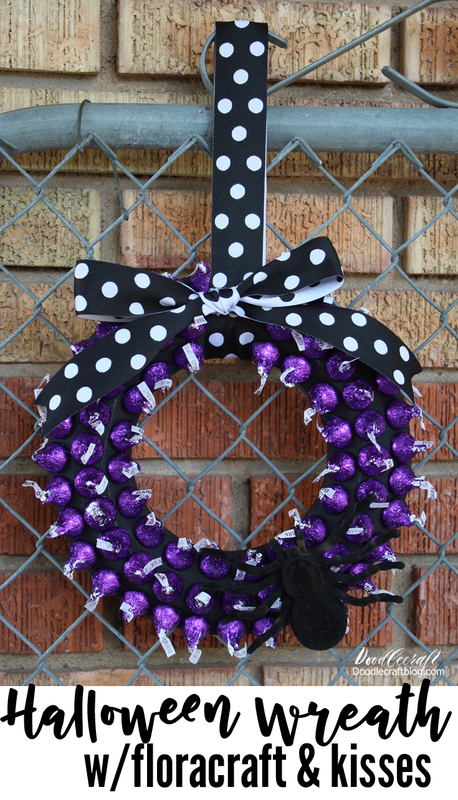 I found these dark chocolate Kisses in purple and knew they would make the best Halloween wreath! Because it's still warm here, I've got this wreath safely inside where it can be easily reached and not melted. Haha, yes, easily reached! Hershey's Kisses and FloraCraft have teamed up to make foam forms the perfect size for Kisses, plus they include double sided adhesive...making this the simplest craft! I think they will be released at Christmas time! Best part, no guess work! They come with the styrofoam form, sticky dots for adhering the kisses to the form and instructions. When painting styrofoam, it's best to use acrylic craft paint. I painted it all black. Once the wreath form is dry, it is ready to decorate! I used some ribbon for easy hanging...in black and white polka dotted. Then stick the Hershey's Kisses to the sticky dots and stick them to the wreath form. Until it's completely full. Then tie a big ribbon bow. Lastly, I hot glued a big scary spider right on the wreath for added fun! It just took minutes and looks adorable--I love the texture and dimension!